Our club publishes three professional style newsletters a year; in January, May and September. Our newsletter is among the best in breed club newsletters, and includes information specific to the Cochin Breed, a letter from the president and vice-president, treasurer's report, announcements of the Nationals sponsored by Cochins International, and much, much more. 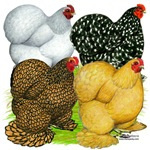 Our club also publishes a Breeders Directory every two years which not only lists members, but what varieties of Cochins they raise, and if stock is sold and/or shipped. We have a well established Master Breeder Program, whereby members earn points based on the number of Cochins exhibited at shows which host Cochins International meets. There are currently three Master Breeder point total recognition levels. The club sponsors three types of Cochins International meets: National, District and Special. All poultry shows may request Special meets. Only one District meet is allowed in a given district in a year and there are two Nationals per year, one east of the Mississippi River and the other west of the Mississippi River. International sites are also included in these meets. The eight district directors, which include an international director, place all meets except the Nationals. The Nationals are rotated among the districts and their placement is decided upon by a host club making an official written bid request sent directly to the president of Cochins International. The president then creates a ballot which is sent to the officers and directors to vote on the placement of the Nationals. Again, all shows may have a Special meet, and it is the responsibility of the show secretaries or members to request these meets from their respective district directors. Membership runs from January 1 to December 31 of each year. Regular individual membership and family membership dues are $15.00, junior membership (under age 18) is $7.50, however junior members do not earn Master Breeder points. If a junior wishes to earn points then he/she must purchase a regular individual membership and compete in an open show. We hope you will consider joining Cochins International today by printing and filling out the linked form. Dues payments can be made by check (Made out to Cochins International) and sent to our membership director, as indicated on the form. Thank you for your interest in Cochins International.